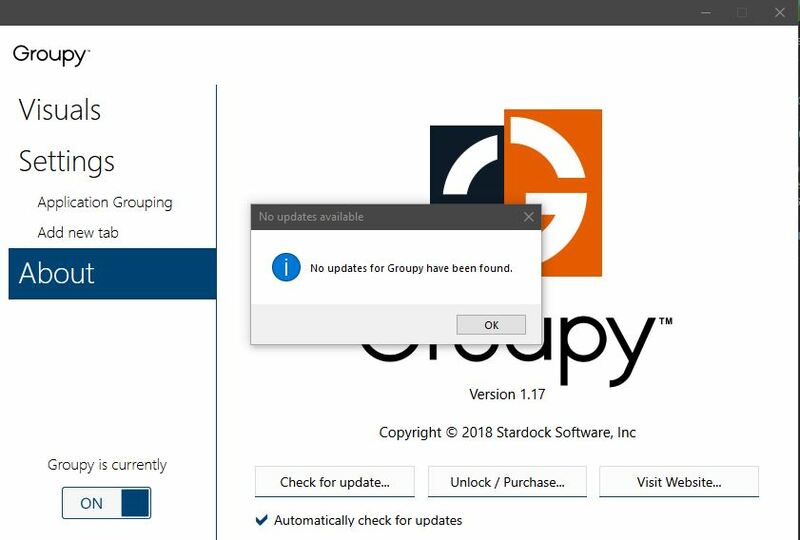 I had to downgrade today to Groupy 1.17. The 1.18 update has virtually unreadable black text on my dark blue active window title bar. I have Windows 10 build 1809 with dark mode enabled. No tweaks. Other programs all use white text on dark title bars, why Groupy does not I have no idea. I am evaluating groupy with the 30 day trial and this is a show-stopper bug. Is this being addressed? Sorry to hear you are having issues. But I have not see it on Dark blue, could you give a screen shot of your problem. While this does not happen with Windows Explorer, I can replicate OP's report in other software. 4 - Result is black text on active window title bar. White text on active window tab. 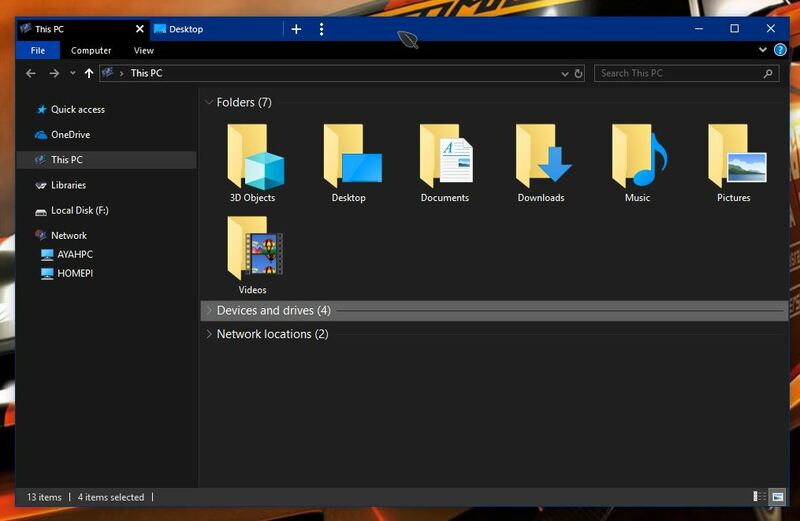 Similar look to Windows Explorer active tab. Has 1.18 been silently pulled? 1.18 is not in the ChangeLog either. Sorting out these errors are part of my evaluation. Being linked to software behind a wall does not build confidence. A version which has no ChangeLog (as of this moment) does not build confidence. But I am keeping an open mind. I really want to like Groupy. I want a version of Groupy that works with Dark Mode as promised. I want to trust StarDock as a company. I need the functionality of Groupy, and it makes a lot of sense. If you still have time left on your Trial OK, if not you have to Buy Groupy. Report here when done if that works for you. Is Stardock going to acknowledge this visual bug and fix it? To be fair, I can still clearly read from your screenshots those active and inactive tabs. But, I have forwarded your problem to Stardock Support team for their assistance. Please keep an eye on this thread for any updates. We appreciate your feedback and patience. This minor issue has been logged internally. Thank you for acknowledging my minor issue and passing it on to the developers. Yes the low-contrast tabs in LibreOffice Writer are technically readable, though inconsistent with how they look in Windows Explorer (where they look stunningly perfect BTW). I understand that Tab software must be hard to write, so hard that MS has seemingly given up on Sets, and that you probably have bigger issues to address. The "Place Above" workaround is appreciated, but I prefer not to take up more vertical space on my monitor if possible. I also use the Combine if possible only, due to not wanting to lose more vertical space in my screen. Just to chime in: Had the same problem and reverted back to 1.17. Personally, I don't consider it a minor issue, when I can hardly read the tab title. I don't use a dark theme, and had the issue with every tabbed program (Command Prompt, Explorer, PowerShell, etc.). But not with 'Always Place Above' set I trust. Any way, congratulations and thank you Stardock. 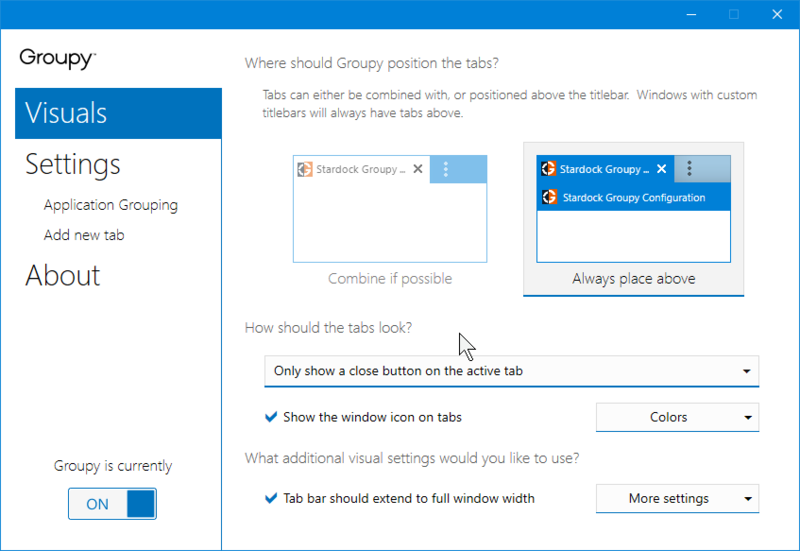 Even if there are minor niggles with Groupy, it's the only tabbed software that I prefer over qttabbar. I bought it because I think it is aesthetically pleasing. Hopefully, you have enough resources to gradually improve it because it really deserves it. I have tested an internal build that fixes this issue. It should be released in a beta after the first of the year some time. But we need to know how you changed the title bar color (the blue and dark gray for example). Is it a Windows theme it inherits, paired with an app that is blue, or is it in the app itself? 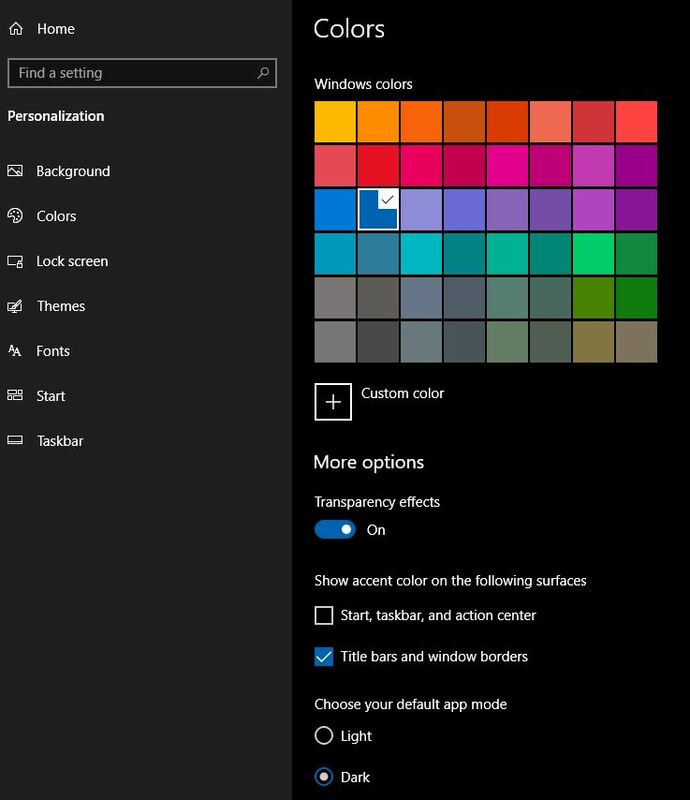 The color was not changed in the app itself, the Active title bar color comes from the Windows 10 interface. I appreciate your work on compatibility with LibreOffice Writer. Ctrl-N for a new document in LibreOffice should pop it open in a tab, as tabbed programs like Firefox, Chrome, Visual Studio Code, Notepad++, etc. do. My 30-days of beta-testing Groupy are near an end, as the program notified me, so I have uninstalled it, since Groupy is not quite ready yet. I am still willing to take the time to provide feedback on here about my experiences. If Groupy irons out its issues I will certainly be purchasing it. The software has great potential. Unfortunately the inactive titlebars not having overly readable text is caused by your choice to alter that colour. The active titlebar colour issue is resolved in the upcoming 1.19, but the inactive issue you have will remain as Groupy is designed to work with the OS standard theme.